ELRIG’S recent Research & Innovation 2018 event showcased the latest trends and tech from the world of drug target research. In the middle of April, we were excited to welcome more than 500 delegates from across the drug discovery community to our annual Research & Innovation 2018 conference. Our two-day event provided a lively discussion forum for the latest innovations shaping the fields of neuroscience and oncology, offering delegates the unique opportunity to attend a range of presentations delivered by world-class academic and industry experts from across Europe. Many of the discussions revolved around how new technologies and strategies are helping to improve the discovery and analysis of novel drug targets. Here, we summarise the key highlights from the conference, as we begin to look forward to our other upcoming events later this year. Research & Innovation 2018 provided 20 stimulating presentations to choose from, including two plenary keynotes. First to kick-off the meeting was Prof Tony Kouzarides, Professor of Cancer Biology at the University of Cambridge, Deputy Director of the Gurdon Institute and Director of the Milner Therapeutics Institute. Drawing from his extensive experience in oncology research, Prof Kouzarides spoke about how increasing collaboration is helping to translate science into life-saving therapeutics to the benefit of cancer patients around the world. Dr Iain Chessell, VP of the Neuroscience Innovative Medicines and Early Development Unit at AstraZeneca, was the second keynote speaker. He focused on pain and neurodegenerative diseases and highlighted how recent technological advances have made it possible for researchers to better select the right targets, review the predictability of animal models, understand target engagement, and quickly generate efficacy evidence from clinical studies. How artificial intelligence (AI) is being used to address common drug discovery and development challenges, such as selecting the best therapeutic hypotheses and ensuring the efficient use of biomedical data to improve clinical study design. The use of genome-wide CRISPR-Cas9 screens in human cancer cell lines for reliable target identification. The implementation of Protein-Targeting Chimeras (PROTACs) to trigger targeted protein degradation, as part of developing new therapeutic modalities. As well as the range of talks on offer at Research and Innovation 2018, the exhibition hall was also bustling between sessions, with approximately 30 exhibitors from around Europe showcasing their latest products and technologies. These included a number of newly launched solutions designed to advance and accelerate the drug discovery process. 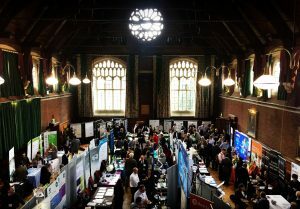 Delegates could also view a selection of posters, providing a comprehensive overview of current research projects within industry and academia. We’d particularly like to congratulate Claudia Stellato, a Post-Doctoral Research Scientist at AstraZeneca, who won the poster competition for her exciting research project, entitled ‘TEMPR (targeted endogenous mapping of pharmacological resistance): a CRISPR-based strategy to identify mutations in the MET kinase domain conferring resistance to Savolitinib’. As the Research & Innovation 2018 meeting drew to a close, delegates and exhibitors began to look forward to ELRIG’s Drug Discovery 2018 conference, taking place in October at the ExCeL Arena in London. This year, our flagship event will highlight the latest ground-breaking research and cutting-edge laboratory technology, designed to provide a better understanding of disease biology and identify novel candidate drugs. So, if you don’t want to miss the chance to learn about recent scientific breakthroughs driving drug discovery success, register today!